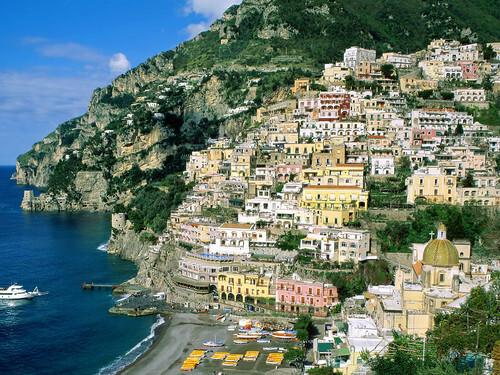 The town of Amalfi is high in the mountains on the Italian coast in the province of Salerno. The city is a UNESCO World Heritage Site and used to be a stomping ground for the British upper classes. Main sights in Amalfi include the cathedral of Sant Andrea, the campanile, the convent of Cappuccini, Chiostro del Paradiso, and the Museum of handmade paper. Amalfi is rich in culture and is famous for its lemon liqueur Limonocello and high quality hand-made paper. Festivals held annual include the feast day of St. Andrew the city’s patron saint the Byzantine New Year’s Eve and the regatta. Country-style cooking is famous all along the Amalfi coast and some tidbits to try include cornetto which is an Italian Croissant, sfogliiatella, follarelli, pizza, mozzarella di bufala which is mozzarella cheese balls, and insalata caprese or Caprian salad. Seafood is also a must when eating along the coast. Shellfish with pasta is just spectacular. Some places to try along the Amalfi coast include Pizzeria Trianon da Ciro, Pasticceria Scaturchio, La Tradizione, A’Sciula, and L’Antica Trattoria.